The Eyre Peninsula and Gawler Ranges are underexplored areas of South Australia (SA) where birds of the SA outback join their Western Australian counterparts. 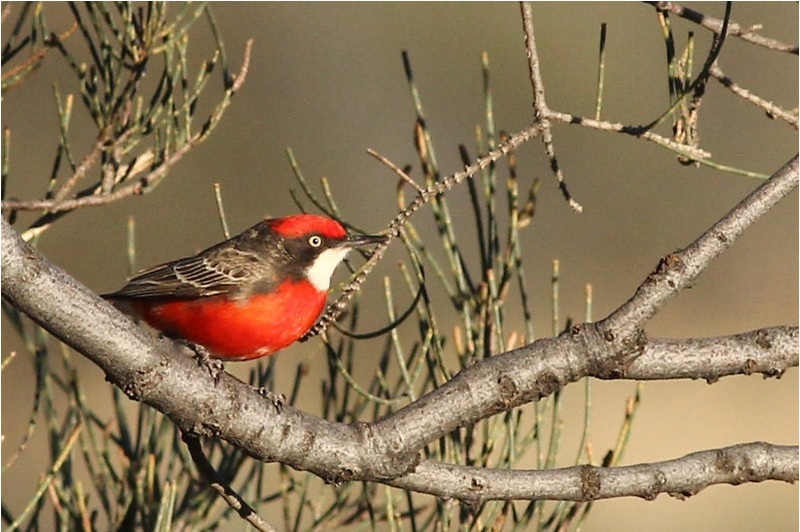 Taking participants to the beautiful coastal scenery at Pt Lincoln (where we feasted on oysters and tuna) and Fowlers Bay (with views of dolphins), the endless mallee around Ceduna, and the scenic Gawler Ranges NP we ended up with a bird list of no less than 166 species. Apart from one windy morning, we were fortunate with the weather, as cool mornings and mild days allowed for comfortable birding. There were plenty of outstanding sightings, the clear winner no doubt being multiple views of the secretive Western Whipbird. Other highlights included Fairy Tern, Western Grasswren, Rock Parrot, Blue-breasted Fairy-wren, Rufous Treecreeper, Western Yellow Robin, Black-eared Cuckoo, and many more. We commenced the trip at the Greenfields wetlands, north of Adelaide. Plenty of waterbirds and waders were present here. Good sightings included Australian Spotted Crakes and Collared Sparrowhawk. At Pt Gawler we observed Slender-billed Thornbills in the low mangroves. We birded the slopes of the Mt Remarkable Ranges with Brown and Rufous Songlark and great photo opportunities of Crimson Chat. It became very windy and a walk in the Arid Lands Botanical Gardens (Pt Augusta) was deferred until the last day. Upon arrival at Whyalla Conservation Park, home of the recently split Western Grasswren, the wind had died down, but we got caught out in a sudden downpour. The tally for the day was no less than 84 species! The wild weather had made way for a beautiful, cool and calm morning and after only half an hour we found an obliging pair of Western Grasswrens. On top of the rocky outcrops, Rock Isotome and pink Eremophilas were flowering, while Budgerigars flew overhead. Further south at Arno Bay we had lunch on the coast and checked out the mangrove boardwalk, from where we observed a pod of dolphins. We checked into our accommodation at Port Lincoln and proceeded straight to Lincoln NP for a a birding feast of Purple-crowned Honeyeater, Fairy Tern, Hooded Plover, Osprey, Black-faced Cormorants and Western Whipbird heard calling. An early start to try and nail those Whipbirds. Despite the odd rain shower we heard Western Whipbird singing at three sites in the dense shrubbery, and after some careful, hard work we obtained multiple views of one bird walking around and later flying. High fives all around! In between all this, a Southern Scrubrobin was being equally elusive, but we eventually got great views and photographs of one perched on a branch in a shrub. We then explored the rest of the National Park and were soon looking at Port Lincoln Ringnecks, Blue-breasted Fairy-wren, Tawny-crowned Honeyeater and we had multiple views of six Rock Parrots foraging in a grassy clearing. The various secluded beaches produced White-bellied Seaeagle, Sooty & Pied Oystercatcher while a Fan-tailed Cuckoo was struggling with a huge hairy caterpillar in one of the campgrounds. After lunch it was time to move on and as we left the National Park we observed a flock of Cape Barren Geese. The drive to Ceduna was uneventful, although a very obliging White-bellied Sea-eagle allowed great photographic opportunities. We feasted on oysters, tuna and wine in the fishing town of Ceduna. A big day in the beautiful Gawler Ranges NP. Wildflowers were abound and a patch of woodland allowed great views of pair of Rufous Treecreeper feeding their recently fledged young. Other good sightings here included Western Yellow Robin, Pied Honeyeater, Elegant Parrot, Hooded Robin, White-fronted Honeyeater, Orange, Crimson & White-fronted Chat. The wind had suddenly picked up as we continued to the welcoming, privately owned sheep station at Mount Ive, where we had lunch and observed a pair of Australian Hobby at their nest. More Crimson Chats were seen, while a grotesquely large fledgling Black-eared Cuckoo was being fed by its tiny foster parent, a Chestnut-rumped Thornbill. After a scenic drive which yielded Cockatiel, Crested Bellbird and Gilbert’s Whistler we ended up in a nice country pub in the wheat-growing town of Kimba. Last day of the tour and after a hearty breakfast we explored nearby Lake Gilles Conservation Park, where highlights included a Pallid Cuckoo at very close range, more Western Yellow Robins, Cockatiels, Budgerigars, two Redthroats and the turquoise race of Splendid Fairy-wren. We moved on to the Arid Lands Botanical Gardens in Pt Augusta, where Chirruping Wedgebill and various Honeyeaters were added to the list. After a sumptuous farewell lunch we drove south via Telowie Gorge where we picked up Grey-fronted Honeyeater, to be back in Adelaide around 7pm. Everyone agreed it had been a highly successful tour! This entry was posted in Birding Reports. Bookmark the permalink.